Republican Candidates Out Walking Tomorrow! 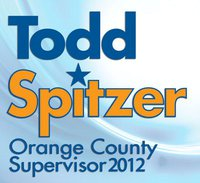 In a huge sign of campaign momentum Todd Spitzer candidate for 3rd District Supervisor and Robert Hammond candidate for County Board of Education are participating in what is set to be a big precinct walk in Tustin tomorrow. (Full disclosure: Custom Campaigns is the consultant running the Hammond race and Todd Spitzer is an advertiser on this blog). Volunteers will meet at 9:00 AM at the Starbucks located at 552 East First Street in Tustin, CA 92780. This is in the Vons shopping center near the corner of 1st and Newport. It is always a major sign of momentum to get a large group of people out walking to support candidates running for offices, especially non-partisan ones. With tomorrow scheduled to be beautiful day according to weather reports this should be a great event. This entry was posted on April 20, 2012 at 3:10 PM	and is filed under 3rd Supervisorial District, Orange County Board of Education. Tagged: Robert Hammond, Todd Spitzer. You can follow any responses to this entry through the RSS 2.0 feed. You can leave a response, or trackback from your own site.